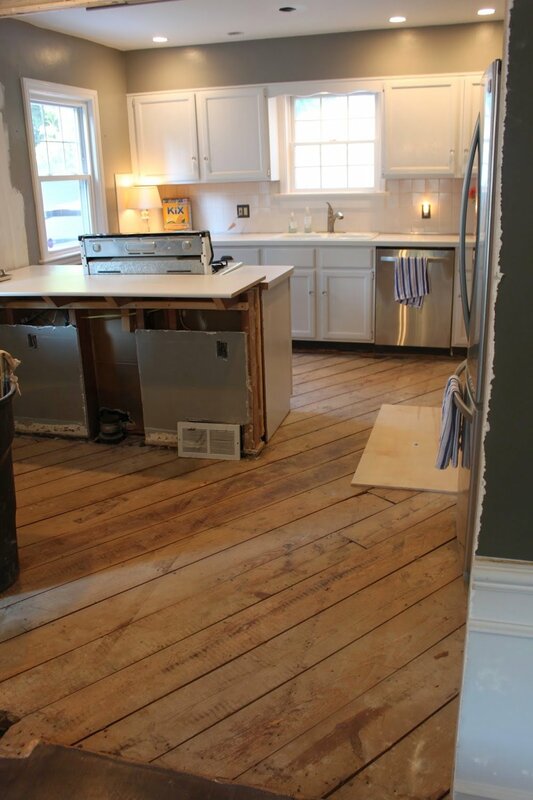 Our kitchen has undergone quite the transformation since we first moved in here 7-years ago! However, we didn't do it all at once. We finished it in different phases as our time and budget would allow - since we did most of the work (with the exception of plumbing, electrical, and laying wood flooring) ourselves! Sometimes I forget how far we've come. Check it out! This is what the kitchen looked like when we bought the house. Two separate rooms - a galley kitchen and a breakfast nook, oak cabinets, white paint, Pergo flooring, and old appliances. I'm not going to lie, there was virtually nothing appealing about it in this state other then the potential we could see it had! To perk up the space before doing any major changes, we painted the cabinets white, painted the walls gray, put in new lighting, and invested in new, clean appliances. Also, accessorizing and decorating can go a long way! These changes made it a much more enjoyable place to live before we were able to really renovate the following year. Next came the fun (and messy!) part! DEMOLITION! We did most of it ourselves on the weekends over the course of a spring/summer/fall of 2012. It was a LOT of work to take down the walls, rip out the floors (the worst part of it all!) and put it all together again. We had major plumbing and electrical work done during this time as well, as several pipes and electrical lines that were in the walls had to be rerouted. It was MESSY but at all worth it! The last phase included all of the finishing touches now that the major demotion/construction was complete. These projects - including adding custom built-ins, adding white trim work, and installing Quartz countertops, were done over the course of a couple years and have just elevated the quality, functionality, and look of the space! As you can see, we've TOTALLY changed this kitchen from a dark, cramped, dated space to a bright, beautiful functional one! It may have taken time but it was well worth the wait!